A High perfomance Run Flat tye designed to allow you to continue driving for up to 50 miles at 50mph. With compact shoulder blocks designed to increase the stiffeness and improve cornering ability and huge longitudinal grooves designed to aid in the rapid displacement of water, the Eufori@ is a perfomance tyre packing a whole lot of punch. A wider tread pattern helps to increase and ensure the widest possible footprint from the tyre offering you the most precise handling you can imagine. 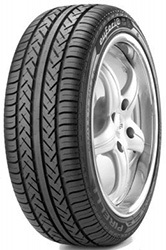 This particular version of the Eufori@ * has been designed in conjunction with BMW engineers and has been approved by BMW to be used as both original and replacement equipment on some of their vehicles, seeking to optimise perfomance from both the tyre and from the car. A superb summer touring tyre designed with perfomance in mind.